Anaconda was presented at last year's Seatec as Pin-Craft's latest novelty in the small crane sector. The technological innovations it carries, such as the possibility to programme its function order, make it a very interesting and space saving item. Anaconda, made out of stainless steel with steel grey finish, was developed by the Tuscany based Company for the very purpose of dealing with greater loads, a sensible decision when taking into account the ever increasing sizes of super yachts and consequently, those of their tenders. The small crane was purposely built for use inside the stern holds to allow the tenders to be moved therein as on to the stern platforms. The Pin-Craft small crane adopts an extendible system managed by sophisticated electronics. This means that when at rest, with the crane retracted and folded back into itself, the space taken up by the whole equipment is truly minimal, whereas when in use, the extension of its arm allows for an easy movement of a tender, even over gangways of generous proportions. 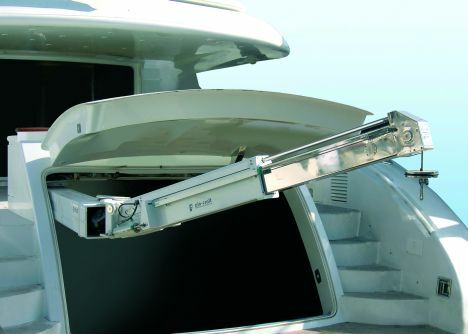 To complete the characteristics of this "robotized" crane, we have a software that programs the optimum course to be taken during launching and beaching operations; this solution greatly limits the need for manual intervention by the crew thus remaining in line with the evolution of on board push button integrated systems. In addition to technical and functional aspects, Pin- Craft has also taken aesthetical appeal into high consideration by giving Anaconda a quality finish and a paintwork to last in time.